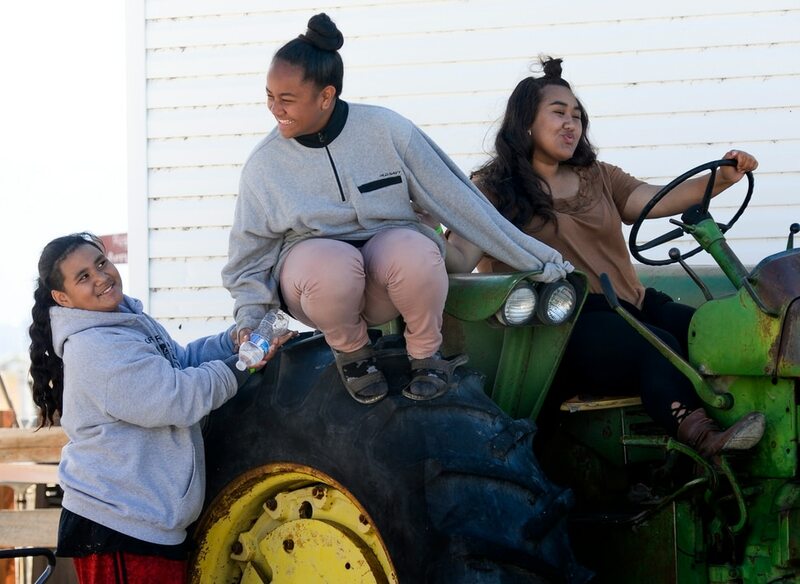 Leah Hogsten | The Salt Lake Tribune l-r Zehlijah Togafau-fiti, Moala Mamatuki and Nohea Leomiti-moe play on the ranch's farming equipment during a church outing to the 2018 Fall Festival at Cross E Ranch in Salt Lake City, Thursday Oct. 18, 2018. Leah Hogsten | The Salt Lake Tribune Shoeless kids jump on the giant jump pad during the 2018 Fall Festival at Cross E Ranch in Salt Lake City, Thursday Oct. 18, 2018. Leah Hogsten | The Salt Lake Tribune Amanda Valdez throws corn into the air while playing in the corn pit with her classmates at the 2018 Fall Festival at Cross E Ranch in Salt Lake City, Thursday Oct. 18, 2018. Leah Hogsten | The Salt Lake Tribune Jana Godfrey, 7, of North Salt Lake buries herself in the 30'x40' corn pit during the 2018 Fall Festival at Cross E Ranch in Salt Lake City, Thursday Oct. 18, 2018. Leah Hogsten | The Salt Lake Tribune l-r June Holley, 11, and her brother Lewis, 4, watch as apple cider donuts cook in the fryer during the 2018 Fall Festival at Cross E Ranch in Salt Lake City, Thursday Oct. 18, 2018. Leah Hogsten | The Salt Lake Tribune Sugar coated and glazed apple cider donuts can be found during the 2018 Fall Festival at Cross E Ranch in Salt Lake City, Thursday Oct. 18, 2018. Leah Hogsten | The Salt Lake Tribune Visitors make their way through the 14 acres corn maze that has nearly 7 miles of trails during the 2018 Fall Festival at Cross E Ranch in Salt Lake City, Thursday Oct. 18, 2018. Leah Hogsten | The Salt Lake Tribune McCall Hutchins, 8, of Centerville rides the 100-foot mega slide feet first during the 2018 Fall Festival at Cross E Ranch in Salt Lake City, Thursday Oct. 18, 2018. Leah Hogsten | The Salt Lake Tribune Kids pose and play around photo booth boards during the 2018 Fall Festival at Cross E Ranch in Salt Lake City, Thursday Oct. 18, 2018. Leah Hogsten | The Salt Lake Tribune Samantha Smith, 8, of Taylorsville gets lost with her family in the 14-acre corn maze during the 2018 Fall Festival at Cross E Ranch in Salt Lake City, Thursday Oct. 18, 2018. Leah Hogsten | The Salt Lake Tribune Visitors tour the cattle farm via hay rides during the 2018 Fall Festival at Cross E Ranch in Salt Lake City, Thursday Oct. 18, 2018. Leah Hogsten | The Salt Lake Tribune We love family and agriculture, educating people and having fun at the same time,Ó said fifth generation farmer Heather Limon, second from right, who operates Cross E Ranch with her brother Dalon Hinckley. The 2018 Fall Festival at Cross E Ranch in Salt Lake City run through Oct. 29, 2018. Attendees at the 2018 Fall Festival at Cross E Ranch in Salt Lake City could fly down a 100-foot mega slide feet first, get lost in a 14-acre corn maze and take a hay ride out to see the cows. “We’re holding the festival because we love family and agriculture, educating people and having fun at the same time,” said fifth generation farmer Heather Limon, who operates Cross E Ranch with her brother Dalon Hinckley. “We’re also the last working cattle ranch in Salt Lake County. Limon said the family farm is celebrating its 50th year in operation. 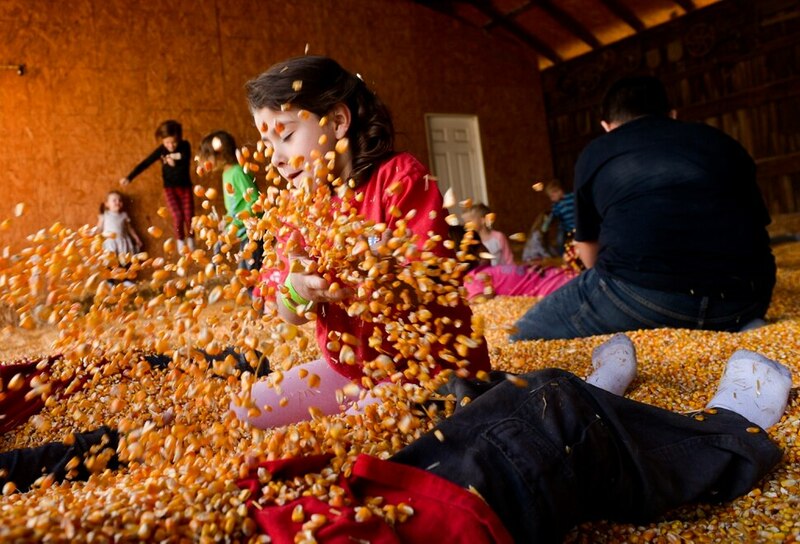 General admission includes a trip to the corn maze, mega slides, hay rides, big and little animals, games, jumbo jump pad, horseshoes, corn pits, live music and movies on the barn. With Food, drinks and pumpkins are available for purchase. The festival runs through Oct. 29. More information can be found at www.crosseranch.com.